ASEAN’s latest summit in Singapore produced little of substance on important issues like the ongoing crisis in Myanmar or the South China Sea. Last weekend, leaders of the ten Southeast Asian members of ASEAN, the major regional organization, held their summit in Singapore. The organization this year has sought to rebuild consensus around key issues like Southeast Asian states’ approach to the South China Sea, as well as the ongoing human rights and humanitarian crisis in Rakhine State. Having Singapore as the chair raised hopes, both within the organization and outside of ASEAN, that ASEAN would regain some of its voice and influence regionally in 2018. So far, however, the most pressing regional issues continue to divide ASEAN, and the organization has not been able to bridge its internal gaps, and to get beyond its traditional consensus style, which almost always hampers it in addressing complex security or rights issues in one member-state. On the crisis in Rakhine State, some ASEAN states, like Malaysia, have spoken out about the rights crisis there (albeit possibly in part to distract attention, within Malaysia, from the Malaysian government’s own corruption scandals in an election year). But other ASEAN countries have been mostly silent, and Myanmar civilian leader Aung San Suu Kyi did not even attend the summit in Singapore. 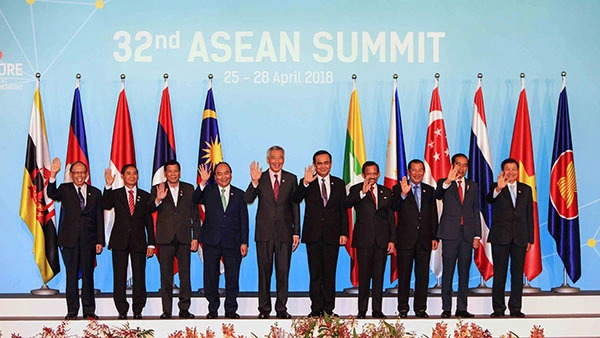 Coming out of the summit, ASEAN was silent about the ongoing crisis in Rakhine State, as well as the lengthy crackdown by Cambodian leader Hun Sen on opposition politicians and civil society, in advance of upcoming Cambodian elections. Similarly, ASEAN appears to remain highly divided about whether to challenge China’s increasingly assertive approach to the South China Sea or simply accede to Beijing, in part in exchange for benefits from Beijing’s economic diplomacy. For more than five years now, Cambodia has been creating intra-ASEAN divides on the South China Sea, and generally promoting China’s position within ASEAN, in exchange for extracting significant economic benefits from Beijing. Under Rodrigo Duterte, the Philippines seems to be embracing this strategy as well, but other ASEAN members like Vietnam and Singapore are extremely wary of Beijing’s South China Sea actions. At this summit, like at so many other ASEAN meetings, the organization simply released a statement about the South China Sea that was bland and had removed any language that could be critical at all—thus making the statement mostly useless. It remains unclear whether ASEAN states will be able to unite to develop a relatively tough common position on a Code of Conduct in the South China Sea, having just begun negotiations with China on a code. Still, leaders at the ASEAN summit did strike a common chord on one issue, making clear that all Southeast Asian states saw huge risks, and little benefit, from a potential U.S.-China trade battle. As Singapore Prime Minister Lee Hsien Loong noted in his opening remarks, the ASEAN chair is “deeply concerned” about rising protectionism globally and the chance of major tensions between Beijing and Washington. It is notable, however, that some Southeast Asian states do share U.S. concerns about Chinese trade practices. While it is true that some Southeast Asian officials, at least in private, do echo the U.S. administration’s concerns about how China has, for years, violated intellectual property (IP) rules and pursued strategies toward foreign investment that have resulted in forced IP transfer and forced localization, China is now the biggest trading partner of ASEAN, and Southeast Asian states are reluctant to stick out their necks and join the White House in some of its tough trade rhetoric. Peace Talk at Panmunjom: A New Opening Or Déjà vu?